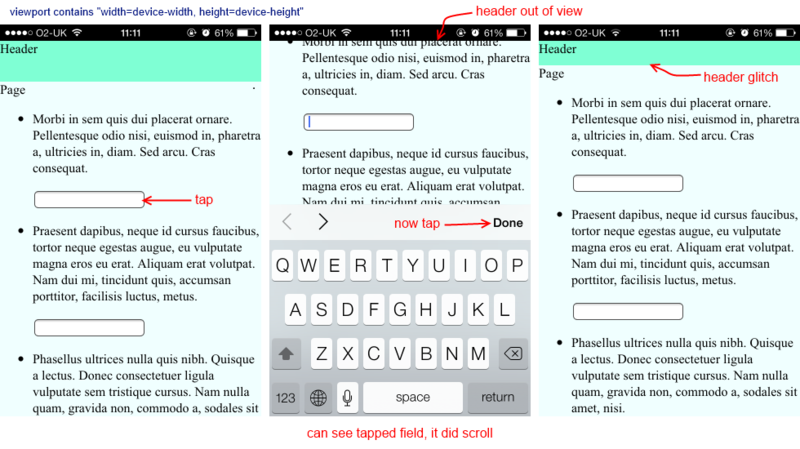 QUESTION: Based on the given examples for homescreen web apps in iOS7 Safari, how can I achieve both a fixed persistent header that never scrolls out of view, and form input fields that scroll into view when tapped? The two examples have one difference, one has height=device-height in the viewport, the other doesn't. The good: The fixed header does not change position/height when tapping the fields. The bad: The user cannot see the focussed field without manually scrolling, or pressing the 'next' button. This can be very tedious, especially if the fields are on a page that doesn't overflow. The good: The user is scrolled to the focussed field as desired. The bad: The fixed header scrolls completely out of view, this needs to be persisted on screen at all times. The scenario is, it will contain a cancel button and a save button that should always be accessible. Also when the field is blurred, the header itself looks squashed until the user scrolls it down into view, but if overflow is disabled then they can't even do this. The ugly: On my non-trivial, real code, away from these simplified examples, there are a bunch of elements that are positioned absolutely within the header to create a curved line 'tab' effect, the alignment of these goes completely off. You should be able to open each demo URL in iOS7 Safari, add to Home Screen, and launch to demonstrate the issue. What is the best way of resolving this? NOTE: I am aware that there are 'bugs' in iOS7 Safari, particularly when it comes to homescreen web apps, however I believe that a workaround may exist related to how I am structuring the page. I have done a large amount of research (see below) but I am struggling to find a solution. It answers what you're asking pretty thoroughly. Fixed positioning is broken on mobile, it can be massaged with JS, but not really even completely fixed. You can fix one problem, your "header glitch" in demo 2 is just the fixed header hiding behind the absolutely positioned #page. Give your header a z-index of 1+ and that will fix that issue. As far as the header losing positioning when the keyboard comes in; I'm not even sure that's actually a bug, just the nature of the browser. What's happening is that the keyboard is gaining focus, at that point you're now dealing with ios' UI not the web browser and everything in the background is freezing (including fixed positioned elements and all other elements). Notice how the entire screens scrolls, that's not a web feature it's a built in browser feature. Not the answer you're looking for? Browse other questions tagged css web-applications ios7 scroll mobile-safari or ask your own question. 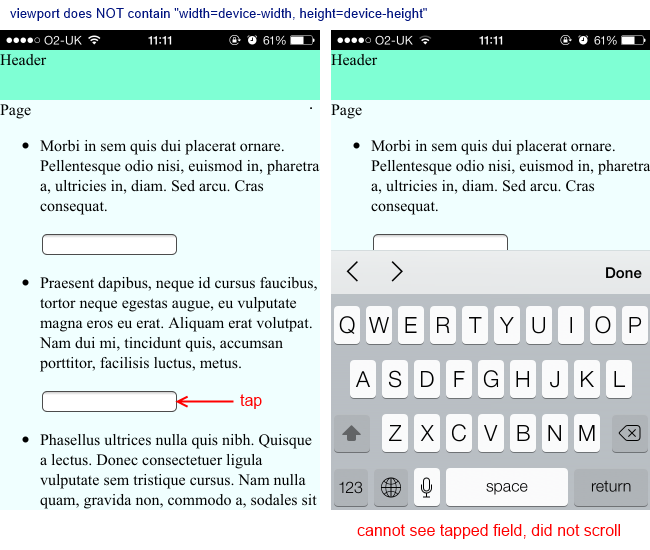 How do I focus an HTML text field on an iPhone (causing the keyboard to come up)? iOS 8 removed “minimal-ui” viewport property, are there other “soft fullscreen” solutions?